Nursery children attend either the morning or afternoon sessions, or all day if entitiled. 30 hour provision is offered from 8.30 - 2.30 pm with an option to top up to 3pm each day at a cost of £10 a week. Children only entitled to 15 free hours may top up to 2.30 each day for £60 a week or 3pm for £70 a week. We also provide breakfast club from 7.50 and after school care until 6pm. If you require more information about Breakfast or Lunch Clubs please speak to the School Business Manager. Reception, Year 1 and Year 2 (ages 4-6 years) start at 8.30am, have a short break mid-morning, followed by a lunch break between 12.10 and 1.20pm. Their school day finishes at 3.00pm. The older children, in Years 3 to 6 (ages 7-11), start school at 8.30am, have a short break mid-morning and a lunch break from 12.30 – 1.30pm. Their school day finishes at 3.05pm. All children who arrive at school after 8.30am must enter via the main reception area and sign in the ‘Late book’. If parents travel to school with children they must enter school with their child and sign the ‘Late book’ stating a reason for lateness. All children who are entered in the ‘Late book’ will be marked as ‘late’ on the school register. If for any reason a child has to be collected during school hours please notify us in advance and in writing. For safety reasons staff are not allowed to release a child unless officially notified. All children arriving at, or departing from the school site during the course of the school day must be signed in and out of our register at the school office. If a child has not been collected by 3.15pm and parents have not contacted the school, the children will be places in after school club and a small fee charged. The main gate will be opened just before 3pm. There should always be an adult to collect younger children. Parents and carers of Nursery and Reception children collect them at the classroom doors. KS1 parents should wait on the main playground as teachers are required to see a parent/carer before dismissing children. KS2 parents should also stand on the main playground and await arrival of the class as children exit from the central door. Older children can be given the opportunity to walk home alone, however, we require advance notification and permission from parents. If an alternative adult is collecting your child you must notify the school office in advance. Children will not be released to unknown individuals, 'older' brothers and sisters / other family members with whom we are not familiar. This opens at 7.50am, closes at 8.30am and costs £1.50 a day. Mrs Finn and Mrs Banks run the Breakfast club and welcome several children daily. They serve a range of healthy food including: cereal, fruit, toast and occasional treats such as waffles or pancakes. This is a wonderful service for working parents that is enjoyed by children of all ages. This must be booked and paid for in advance using the Parent Pay. Speak to the School business Manager for details. We run an after school club from 3.00pm until 6pm. Parents may choose to pay up until 4pm or until 6pm. 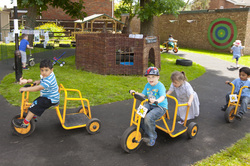 The club is run by two staff members and children are provided with a range of games and activities to keep them occupied. children staying beyond 4pm will also receive a small snack.